Pteropods, or sea snails, are sentinel indicators of the biological impacts of ocean acidification. SCCWRP and its partners are using pteropods to show that coastal estuary environments could be impacted by acidification faster and with greater intensity than comparable areas of the open ocean. Washington’s Puget Sound could be on a trajectory to experience fundamental changes to ecosystem integrity in just a few decades. SCCWRP and its partners have shown in a set of preliminary analyses of Washington’s Puget Sound that coastal estuary environments have the potential to be impacted by ocean acidification (OA) faster and with greater intensity than comparable areas of the open ocean. 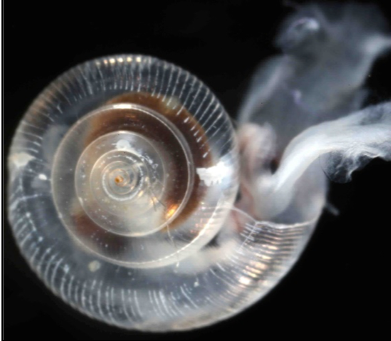 The ongoing study, which involves linking biological field data to OA chemistry data for Puget Sound, is among the first to chronicle how pteropods, or sea snails, are being impacted by OA in estuaries – and how these impacts are predicted to intensify in response to increasing ocean acidity and other stressors, including nutrient loading, local atmospheric carbon dioxide releases and freshwater inputs that reduce Puget Sound’s buffering capacity. For more than a decade, scientists have focused on chronicling how the open ocean will be impacted by a gradual increase in seawater acidity stemming from increased atmospheric carbon dioxide emissions. This work includes the ongoing development of a West Coast computer model by SCCWRP and its partners that predicts how OA’s impacts will play out in the coastal ocean. Comparatively less attention has been focused on semi-enclosed estuary environments like Puget Sound, which as recently as five years ago were hypothesized to be more ecologically resilient to the impacts of OA than the open ocean. Unlike the open ocean, estuaries can experience dramatic swings in pH, aragonite saturation state and dissolved oxygen levels across various time scales, from hourly to daily to seasonally; researchers initially believed this variability would make estuaries less susceptible to OA’s impacts. The Puget Sound study, initiated in summer 2018, is analyzing three years of data on pteropods – among the most sensitive organisms that form calcium carbonate shells – then linking the pteropod data to OA and nutrient loading data to understand how OA’s complex interaction with co-occurring stressors appears to be triggering a ripple effect of ecological impacts to estuarine health. The preliminary results indicate that during certain seasonal periods, Puget Sound has already surpassed critical physiological thresholds for pelagic calcifiers. At this rate, Puget Sound could be on a trajectory to experience fundamental changes to ecosystem integrity in the timespan of just a few decades. Detrimental impacts to pelagic calcifiers are projected to play out more intensely and rapidly in Puget Sound than in adjacent areas of the open and coastal ocean, according to the study’s initial analyses. Based on the study’s findings, other estuary environments that share similar physical and chemical characteristics with Puget Sound could be similarly susceptible, including estuaries in California. Meanwhile, SCCWRP is participating in a recently initiated effort to assess the biological vulnerability of the San Francisco Bay estuary to OA and co-occurring stressors, which will improve understanding of OA in West Coast estuarine systems. Much more OA monitoring would be needed to begin tracking potential OA-related estuary impacts in Southern California. For more information, contact Dr. Nina Bednarsek.